Maya Khankhoje worked as a simultaneous interpreter for forty years. In her profession, people have to understand and speak several languages. They also have to gauge the register of a given language at different social levels. Politicians are very “woke” to this fact. 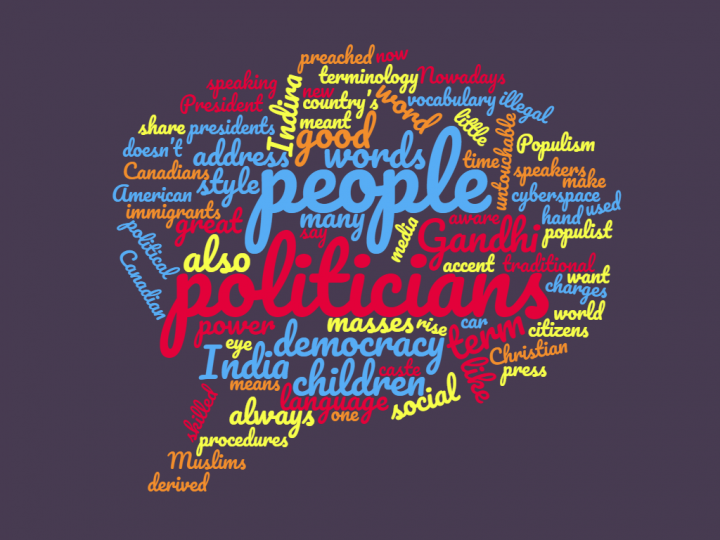 A quick search of the term populism in cyberspace reveals its increasing popularity (no pun intended) in the last decade, in both traditional and social media. The term democracy, on the other hand, became de rigueur a long time ago when royal heads started rolling in Europe and elsewhere. Both terms share semantic roots. Populism is derived from the Latin populus, or people, and democracy is derived from the Greek demos, which means the same. There is a great overlap in meaning but not in praxis. Populism does not always equate with democracy. However, politicians, especially those who wish to bypass cumbersome procedures such as checks and balances, public consultations, parliamentary procedures, the judiciary, fair electoral practices and all the trappings of democracy, resort to the use of a carefully calculated language. They do so by speaking to the people directly, by eschewing the traditional press, by manipulating Internet and social media, and most importantly, by doing so in the vernacular. We all have memories of Princess Diana crouching at eye level to speak to little children. She did it most probably because she understood and loved children. This is what good teachers and good parents do with their little charges so as not to intimidate them. This is also what skilled politicians metaphorically do while seeking the attention and trust of the citizens whom they view as their charges. President Obama was very skilled with this technique. Notice how he always addressed the people as “folks” in spite of his Harvard education and sophisticated vocabulary. Also note that his accent would go mildly south as in Southside Chicago where there is a very large Black population. Did I say Black? Sorry, I meant African American. Unfortunately, a shift in political terminology to refer to a particular community does not necessarily change the degree of their disenfranchisement. President Trump, on the other hand, doesn’t have to make his speaking style more colloquial. He is a natural with feel-good words like “great,” “huge,” “beautiful” and so forth. He also does not shy away from crude words. The late Indian Prime Minister Indira Gandhi used verbal symbolism to very good effect. “Indira is India and India is Indira” was her slogan. For the sake of her illiterate constituents, her party’s symbol was a cow with a calf, depicting her as Mother India nurturing the masses, particularly the cow-worshipping Hindu masses. Her Italian-born daughter-in-law, Sonia Gandhi, studied very hard to improve her Hindi vocabulary and accent. This facilitated her rise to power after the assassinations of her husband and her mother-in-law. Canadian politicians are also adept speakers, at least the good ones. “Fellow Canadians” is a very Canadian term, not too folksy, not too snobbish. Québec politicians, when they have to address Anglo Canadians in English, make sure to sprinkle a few French words here and there so as not to offend their real political base. Going back to the term “folk:” this, of course, is a Germanic word. Did you know that it was Hitler who named the iconic Volkswagen? He wanted Porsche to design a car that would appeal to the common people, so he called it “the people’s car.” I wonder whether many of the flower children who protested against the Vietnam War from the windows of their beat-up Volkswagens were aware of its origin. Probably not. Latin American populist politicians are very charismatic speakers. Ciudadano Presidente is the official style of address for Mexican presidents, making people think that presidents are just plain citizens like them. Compañero is a stock word with left-wing politicians. Originally it meant somebody with whom you share a crust of bread, like a life partner or a comrade in arms. Nowadays it merely means that politicians want you to feel that you belong. Back in India, Mahatma Gandhi renamed members of the so-called untouchable caste “Harijans,” or God’s children. Nowadays the correct terminology is Dalits, or oppressed people. Gandhi, as a shrewd lawyer turned politician, realized the importance of deconstructing the language of the caste system. Never mind that he did not want one of his sons to marry an “untouchable” woman. The rhetoric of politicians doesn’t always match their actions or beliefs. Populists have been aware of the power of language since time immemorial, but now they have to deal with what the Italian press calls “il nuovo proletariado digitale.” This new digital proletariat is fed-up with weak institutions, rigged elections, a never-ending technological revolution, a precarious labour market, and in general, an unsettled world. To address these frustrations and fears, populist politicians rely on a highly personalized style of leadership. Italy and Hungary have recently acquired such leaders. Victor Orban rose to power in Hungary with the promise of safeguarding the country’s security and Christian values. Here the word Christian has nothing to do with the love preached by the son of a carpenter, but rather with the hatred preached by extreme right-wing patriarchs against immigrants, refugees and Muslims. Italy, the land that used to sing Avanti il popolo (Forward, people!) with internationalist enthusiasm, now shouts in cyberspace Fuori i clandestini (Out with illegal immigrants!) in fits of xenophobic rage. She also added that her country’s Buddhist majority was being swamped by Muslims. This appears to be her ahimsa way of turning a blind eye to the plight of 600,000 displaced Rohingya. She has shocked many of her admirers, but who knows what is really going on behind Myanmar’s bamboo wall? William Shakespeare was an acute observer of people and a master spinner of words. He would have advised the “many great men that have flattered the people who ne’er loved them” to be more direct. He would have told them to simply say: “Friends, Romans, countrymen, lend me your ears.” And the populace would have listened.